Three pewter metal miniatures of Mythos Creatures from Achtung! Cthulhu in 28mm scale. Achtung! Cthulhu miniatures are scaled to sit alongside other popular World War Two miniatures ranges. Comes with 3 x 30mm round display bases with raised lip, some assembly maybe required. 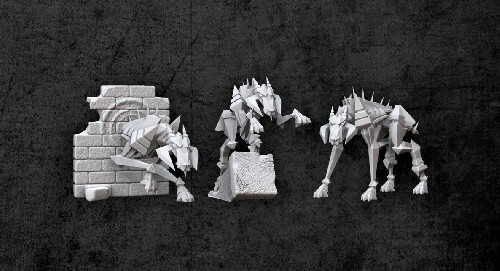 Includes three Hounds of Tindalos, one emerging from a wall, one about to pounce and another ready to hunt your Investigators!